Customer data challenges are among the most vexing and pervasive that life sciences companies currently experience, especially with the increasing regulatory pressure and the transition to new business models they face. But are organisations getting what they need from their data to deliver true customer insight and drive commercial success? 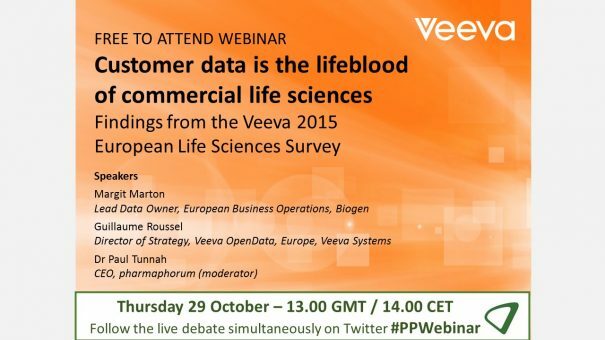 If you are responsible for acquiring, maintaining or using commercial customer data and if better customer insight is important to you, this is your opportunity to hear more from the Veeva 2015 European Life Sciences Survey. The live broadcast took place on 29 October 2015 at 1pm GMT, 2pm CET. To view the on-demand version, please click here or on the webinar widget below. Margit Marton (Gigi) has been the Lead Data Owner at Biogen since September 2014. With more than 20 years of IT and master data management (MDM) experience in various companies on the consulting and the customer side, Margit has built the vision, guidelines and strategy for how data is governed and led complex MDM implementation projects. She has led awareness and business change programmes to introduce the MDM concept through management commitment and built cultural change programmes for MDM implementation. Guillaume Roussel is Director of Strategy for the Veeva data offerings in Europe. Over the course of 13 years at Cegedim, Guillaume launched technology solutions designed to support the unique sales, marketing, and compliance needs of life sciences companies. He also led Cegedim’s compliance business sector across Europe to help organisations address the region’s fast-emerging transparency requirements and he created the global marketing strategy for customer data development. With his unique experience, Guillaume is set to drive the industry toward greater transparency, agility, and global harmonization by delivering a world-class master data solution in the cloud.